Barcelona are said to be eyeing up club legend Xavi Hernandez as a replacement for Ernesto Valverde at the Camp Nou. 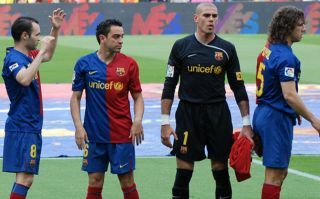 During his long stint in Catalonia, Xavi became a cult hero at Barca, helping the club win a whole host of silverware, including numerous Champions League and La Liga titles. Because of this, Xavi will know the club’s ethos and philosophy inside and out, something that’ll help him dearly should he be trusted with replacing Valverde at the helm at Barcelona in the near future. As per Don Balon, Barca are aware that Valverde is not going to be at the club forever, and are thus searching for someone to replace the Spaniard when the time is right. The report further states that Xavi is being eyed up by the Spanish giants to replace the former Athletic Bilbao boss, a move that is surely going to delight a large number of Blaugrana fans should it actually happen. Valverde has done a great job at the Nou Camp since being made manager back in the summer of 2017, winning a La Liga and Copa Del Rey double in his first season at the club. Despite this, some fans still aren’t happy with Valverde’s performance at the Camp Nou, with some pointing to the club’s failures in the Champions League last year as one of the reasons as to why he should be replaced. Appointing Xavi would be a risky but potentially rewarding move from Barca, as the Spaniard has no pervious experience of coaching a top level side, however the midfielder knows the club better than anyone, two elements that could see this appointment go either way should it end up occurring.